USA-17—a 90-foot-long (27 m) trimaran, type BOR90. A trimaran (or double-outrigger) is a multihull boat that comprises a main hull and two smaller outrigger hulls (or "floats") which are attached to the main hull with lateral beams. Most trimarans are sailing yachts designed for recreation or racing; others are ferries or warships. 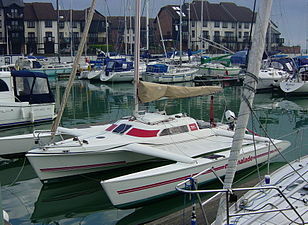 The word "trimaran" is a portmanteau of "Tri" and "(Cata)maran". The term is thought to have been coined by Victor Tchetchet, a pioneering, Ukrainian-born modern multihull designer. The first double-outrigger boats were developed by the Austronesian people and are still widely used today by traditional fishermen in maritime Southeast Asia and Madagascar. It developed from the more ancient single-outrigger boats as a way to deal with the problem of the instability of the latter when tacking leeward. Double-outrigger boats, however, did not develop among Austronesians in Micronesia and Polynesia (although it exists in western Melanesia), where single-outrigger boats and catamarans are used instead. Some of the current US terminology are derived from the Polynesian terminology on outriggers, despite trimarans not being native to the region. Sailing catamarans and trimarans gained popularity during the 1960s and 1970s. Amateur development of the modern sailing trimaran started in 1945 with the efforts of Victor Tchetchet, a Ukrainian émigré to the US, who built two trimarans made of marine plywood, which were about 24 feet (7 metres) long. He is credited with coining the term, "trimaran." In the 1950s and 60s, Arthur Piver designed and built plywood kit trimarans, which were adopted by other homebuilders, but were heavy and not sea-kindly by modern standards. Some of these achieved ocean crossings, nonetheless. Other designers followed, including Jim Brown, Ed Horstman, John Marples, Jay Kantola, Chris White, Norman Cross, Derek Kelsall and Richard Newick, thus bringing the trimaran cruiser to new levels of performance and safety. Following the homebuilt movement, production models became available. Some trimarans in the 19–36-foot lengths (5.8–11.0 m) are designed as "day-sailers" which can be transported on a road trailer. These include the original Farrier – Corsair folding trimarans, such as the F-27 Sport Cruiser – and original John Westell swing-wing folding trimaran (using the same folding system later adopted also on Quorning Dragonfly) and like trimarans. The trimaran concept has also been used for both passenger ferries and warships. For example, in 2005 the 127-metre trimaran (417 ft) Benchijigua Express was delivered by Austal to Spanish ferry operator Fred Olsen, S.A. for service in the Canary Islands. Capable of carrying 1,280 passengers and 340 cars, or equivalents, at speeds up to 40 knots, this boat was the longest aluminum ship in the world at the time of delivery. A modern warship, the RV Triton was commissioned by British defence contractor QinetiQ in 2000. 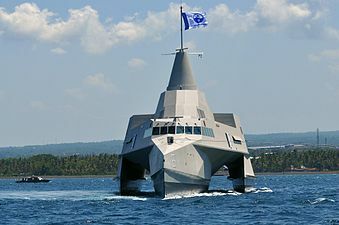 In October 2005, the United States Navy commissioned for evaluation the construction of a General Dynamics LCS trimaran designed and built by Austal. The DARPA is experimenting with the trimaran design, and in 2012 awarded SAIC a contract to perform Phases 2 through 4 of the ACTUV Program. The contract is expected to be completed by August 2015. LoeRea, 60-foot (18-metre) trimaran used in the movie, Waterworld. 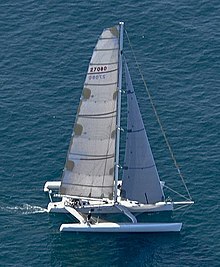 According to American usage, there are three Polynesian terms that describe the main components of catamarans and trimarans, namely: “vaka”, “aka” and “ama”. Vaka is the canoe or main hull. Aka is the framework member that connects the vaka (hull) to the ama (outrigger, or “float”). Ama is the outrigger, connected to the vaka by an aka. (The above terminologies reflects only American usage. In the UK the main hull of a trimaran is called simply the main hull or centre hull. The outrigger hulls are floats or "outriggers". The structures between the main hull and the floats are called the wings and the structural portions thereof are beams). In most cruising trimarans the wings are solid and cabin accommodation extends over them, while in racing trimarans accommodation is limited to the main hull and the wings are open sheets of netting. In comparison to traditional Austronesian outrigger canoes, modern western-built trimarans typically do not use Austronesian rigging like tanja or crab claw sails. Instead they use a standard Bermuda rig. Trimarans are also typically significantly wider. In addition, trimaran floats are much more buoyant than those of outrigger canoes to support a large sailplan. They contribute to drag when heavily immersed, and their level of immersion indicates when to reef. In terms of performance, an objective comparison by Doran (1972) in terms of maximum progress against the wind, maximum speed, and speed downwind concluded that both the traditional double-outrigger vinta of the Philippines and the single-outrigger wa of the Caroline Islands, respectively, are still superior to the modern trimaran. Two types of trimaran exist: the bridgedeck trimaran and the open trimaran, which features a trampoline between the hulls instead of any platform. Trimarans have a number of advantages over comparable monohulls, principally being very much faster and less prone to heeling (although a trimaran heels more than a catamaran). Comparing a trimaran and a monohull of the same length, the former has a shallower draft, a wider beam, less wetted area, and is able to fly more sail area. Because of the righting moment provided by the wide beam, trimarans do not need a monohull's ballasted keel. As a result of the wide beam, the trimaran is able to maintain its stability in stronger winds, thereby offering much better straight-line performance than a monohull, along with the ability to navigate in shallower water. However, its wider beam requires more space to manoeuver, so tacking and gybing can be trickier in confined areas. Trimarans with open wings typically have narrower hulls (and thus less living space) than a same length monohull; but trimarans with solid wings can have a bridgedeck giving ample saloon accommodation. Trimarans require significantly more docking space in marinas, unless the ama can be folded to reduce the beam. As the righting moment (the force that resists the opposite torque of the wind on the sails) is produced by a float, or ama, rather than a heavy protruding keel, trimarans are lighter and faster than a monohull of equivalent length. A lightweight retractable keel or foil, referred to as a centerboard or daggerboard, is often employed to resist lateral movement, making many models easily beachable. Most trimarans are difficult to flip sideways given a reasonable degree of caution, however, trimarans can reach speeds so great in high winds that they can plow into the back of a wave and flip end-over-end (pitchpole). This hazard is especially dangerous for a multihull that is using a spinnaker in high winds and large seas. To avoid this unfortunate scenario trimaran sailors are advised to reduce sail and to always have all sails easily released. The use of trampolines with a large weave, to allow water to easily pass through, and the deployment of parachute anchors drogues and sea anchors whenever appropriate should reduce the risk to an acceptable degree. Demountable fixed tubes: Some trimarans are built demountable to allow them to be trailered to a launch site and then assembled before launching. This takes longer than a folding system but is typically lighter and less costly, and can also be used for craft with too much beam for a folding system. For example, the small modern Weta Trimaran uses tubes to connect the floats to the main hull, which are lashed in from a canvas trampoline and further held in place by the sidestays. Similarly, the original Dragonfly Trimarans (Dragonfly 600) and the home built W22 trimaran use this design. Telescopic tubes: The French company Astusboats produces a range of trimarans that use telescopic tubes to connect the floats to the main hull. Hinge and latch: The W17 trimaran uses a strong hinge and latch system that allows the amas to fold over the main hull to reduce width for trailing. Suitable for craft under 18 ft only unless waterstays are added. Vertical folding: Farrier Marine use a vertical folding mechanism, first used on the Trailertri and subsequently on most of his designs. All Farrier designed boats are known as Fboats (F22, F24, F27 etc.). Whisper also uses a vertical folding mechanism  as do Corsair Marine, who use the vertical folding mechanism designed by Ian Farrier. (When Farrier resigned from the company in 2000, the "F" (for Farrier) designation was replaced with a "C" (for Corsair) designation on their trimarans.) Trimax trimarans use a folding mechanism claimed to be a further development of the Farrier design. Horizontal articulation: Dragonfly Trimarans use a nearly horizontal articulation called SwingWing. The slight angle makes the floats fold into the narrower, lower part of the central hull and also increases stability when in the folded position. A similar horizontal articulation design is also used in the Sea on 96CRB. This kind of system was first used in Ocean Bird trimarans designed by John Westell and built by Honnor Marine Ltd of Totnes. Horizontal folding: Telstar trimarans uses a unique horizontal folding design along with a simple mast raising system to facilitate trailer sailing. It can be powered easily with the amas folded in or extended. Although it is possible for a trimaran to capsize, this is less frequent than with monohull boats because of the greater resistance to rolling that the amas offer. Most trimaran designs are considered nearly unsinkable because even when filled with water, the buoyancy of one ama is enough to keep the entire vessel afloat. Because of their stability and safety, special trimarans such as the Challenger have become popular with sailors who have restricted mobility. Trimarans designed for safety have amas with multiple sealed partitions, controls that all run to the cockpit, a collision bulkhead, partial or full cockpit coverings or windshields, and drain holes in the cockpit that can adequately drain the cockpit quickly, among other things. Trimaran capsizes are more likely to be of the pitchpole type than a roll to one side due to their higher sideways stability and speeds. Capsized trimarans are harder to turn upright after they have turtled than monohull boats. While some capsized trimarans righted by sideways rotation may suffer heavy damage to mast and rigging, many modern and ancient trimarans are explicitly designed for this method of righting. Harnesses pulling on the stern toward the bow, or from the bow toward the stern of capsized trimarans have been shown to be able to successfully turn them end-over-end. Several design features reduce the chance of pitch-pole capsize; these include having wing nets with an open weave designed to reduce windage and decks and nets that shed water easily. The best way to avoid capsize is to reduce sail in heavy weather. Competing with a giant trimaran the BMW Oracle Racing team representing the Golden Gate Yacht Club won the 2010 America's Cup on February 14, 2010, off Valencia, Spain, beating the giant catamaran Alinghi 2-0 in the best-of-three series and becoming the first American syndicate to win the cup since 1992. The large rigid wing sail of the USA 17 trimaran provided a decisive advantage and the trimaran won the America's Cup by a considerable margin in each race. Thomas Coville holds the new world record for solo circumnavigation of the world by sailing the trimaran, Sodebo Ultim, set on December 25, 2016 with a time of 49 days and 3 hours. Prior to his feat, Francis Joyon held the world record for solo circumnavigation of the world, set on January 20, 2008. The 51-year-old Frenchman circled the planet alone in 57 days, 13 hours, 34 minutes, 6 seconds in a trimaran. He beat British sailor Ellen MacArthur's record set in February 2005 for which she spent just over 71 days at sea. Earthrace holds the current UIM (Union Internationale Motonautique) powerboat record for an equatorial circumnavigation via the Panama and Suez canals. 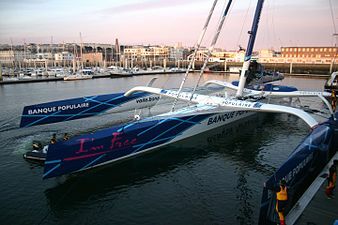 Hydroptère, an experimental sailing hydrofoil trimaran, briefly reached 56.3 knots (104.3 km/h; 64.8 mph) near Fos-sur-Mer, but capsized and turtled shortly thereafter. RV Triton was a Research Vessel for the Royal Navy. She was built as a technology demonstrator ship for the Royal Navy's Future Surface Combatant, and has been used to prove the viability of the hull-form. Since 2007 the ship has been used by the Australian Customs and Border Protection Service's Customs Marine Unit. Littoral combat ships built by General Dynamics at Bath Iron Works are of a trimaran design. USS Independence (LCS-2) is the first of these ships. Littoral combat ships built by Lockheed are of a monohull design. First launched on 31 August 2012 at Bali Strait, 63M Carbon Fibre Composite Trimaran Fast Missile Boat (Indonesian: Kapal Cepat Rudal [KCR]) named KRI Klewang (625) – a traditional Indonesian single edge sword, was the first stealth trimaran of the Indonesian Navy built by North Sea Boats at Banyuwangi, East Java, Indonesia. This ship combined a number of existing advance technologies into a single, unique platform; a wave-piercer trimaran hull from, constructed exclusively of infused vinylester carbon fibre cored sandwich materials for all structural elements, with external "stealth" geometry and features intended to reduce detection. The KRI Klewang (625) caught fire because of an electrical short-circuit in the engine room during a maintenance period on September 28, 2012 and was a total loss. 43 Meter Trimarans called Ocean Eagle from CMN wharf with design from Nigel Irens und Prolarge based on the Ocean Adventurer concept will provide coastal protection for Mozambique. 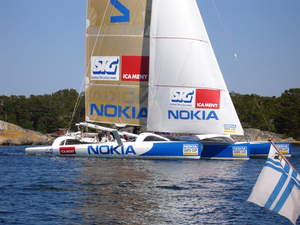 Nokia in 2005, a 60-foot-long (18 m) trimaran, built for the Open Ocean Performance Sixties (ORMA 60) series. Banque Populaire V in 2009. At the time, the largest maxi-trimaran and holding the 24 hours distance and transatlantic records. 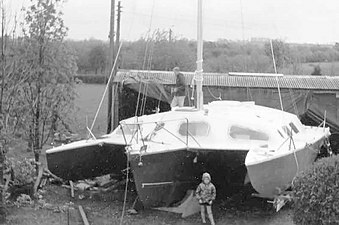 A home-built cruising trimaran under construction in 1972. Speedboat Earthrace at a dock in Malmö, Sweden. 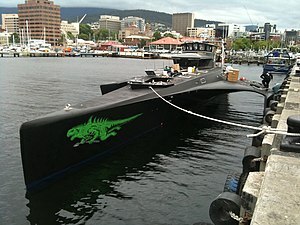 MV Gojira at port in Hobart, Tasmania. X3K at Bali Strait in Indonesia. ^ a b "Victor Tchetchet". Multihull Maven. ^ a b Hornell, James (1932). "Was the Double-Outrigger Known in Polynesia and Micronesia? A Critical Study". The Journal of the Polynesian Society. 41 (2 (162)): 131–143. ^ Doran, Edwin, Jr. (1974). "Outrigger Ages". The Journal of the Polynesian Society. 83 (2): 130–140. ^ Harris, Robert B. (1965). "Catamarans: A Revolution in Sailing History". Archon. Zeta Phi Beta Sorority, Inc. (Fall 1965): 12. Now gaining popularity is the trimaran, a triple-hulled craft of an ancient origin as the catamaran. [...] Trimarans have now crossed both the Atlantic and the Pacific. ^ Randy Thomas. "Multihulls Discovered: Part 1: Their origins, myths, magic, mana... and caveats that go along with these craft that have evolved from ancient heritage". Yachting. Retrieved 2015-01-01. ^ "Delivery Benchijigua Express – Austal". Archived from the original on 2006-04-22. ^ "Defence – Littoral Combat Ship (LCS) – Austal". Archived from the original on 2008-08-20. ^ "DARPA Tactical Technology Office". Archived from the original on 2012-08-09. Retrieved 2012-08-16. ^ a b c d e "A primer on proas". Archived from the original on 2007-10-08. Retrieved 2007-10-30. ^ Edwin Doran Jr., Texas A. & M. University (1972). "Wa, Vinta, and Trimaran". Journal of the Polynesian Society, Volume 81, No. 2. Retrieved 2015-01-01. In contrast to double-outrigger canoes, however, [trimaran] floats are often quite large and buoyant and contribute considerably to drag which slows the boat. [...] The Pacific canoes are notably more narrow ([length/beam] ratios of about 10 and 13 respectively) than the trimaran (ratio of about 7). 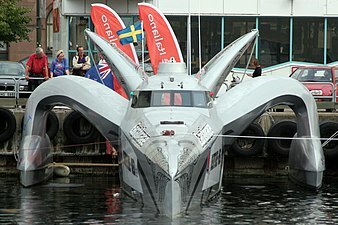 ^ "trimax 1080 trimaran". Retrieved 2009-10-10. ^ "SwingWing Presentation". Archived from the original on 2011-04-09. Retrieved 2009-05-10. ^ David Owen (1970). "Trimariner". Archived from the original on 2011-04-02. Retrieved 2009-05-26. ^ "Weta Owners Manual". Retrieved 2015-01-01. ^ Edwin Doran Jr., Texas A. & M. University (1972). "Wa, Vinta, and Trimaran". Journal of the Polynesian Society, Volume 81, No. 2. Retrieved 2015-01-01. Seaworthiness is implicit in the ability to make such voyages. A specific point illustrating the latter is the technique known to Caroline Inslanders for righting their canoes after they have capsized at sea. In brief, the mast is rigged from under side of float to a sheer legs erected above the bottom of the capsized boat. Four men climb quickly up the inclined mast, their weight forcing the float to submerge to a point directly underneath the main hull. Past this point the float's own buoyancy takes it back to the surface in righted position whereupon the canoe is bailed, rerigged and continues on its voyage. ^ Staff (December 25, 2016). "French sailor Thomas Coville sets new record for solo sailing circumnavigation | DW | 25.12.2016". Deutsche Welle. Retrieved 2019-02-19. ^ "Hydroptere: 61 knots and huge crash with 35-38 knots, gusts over 45". Fos-sur-Mer: Catamaran Racing. December 22, 2008. Retrieved 2013-11-19. Jim Howard, Charles J. Doane. Handbook of offshore cruising: The Dream and Reality of Modern Ocean Cruising. C. A. Marchaj. Aero-Hydrodynamics of Sailing. Tiller Pub. ISBN 1-888671-18-1.